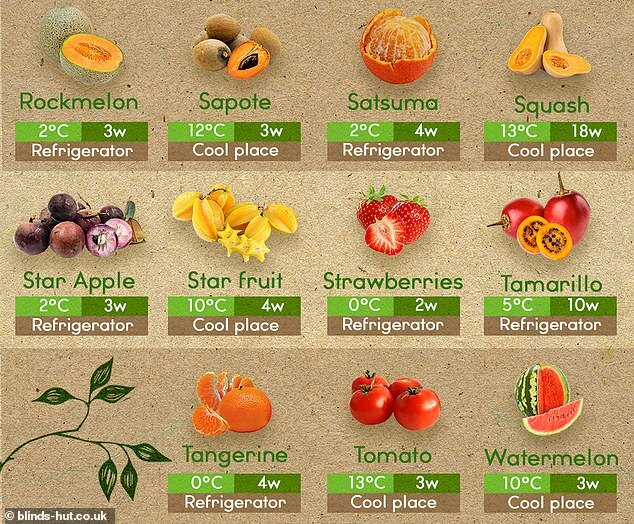 Does most of YOUR fruit and veg go in the bin? Many of us would like to cut down on food waste, but if your fruit is forever turning mouldy and vegetables going limp it’s hard to stick to good intentions. 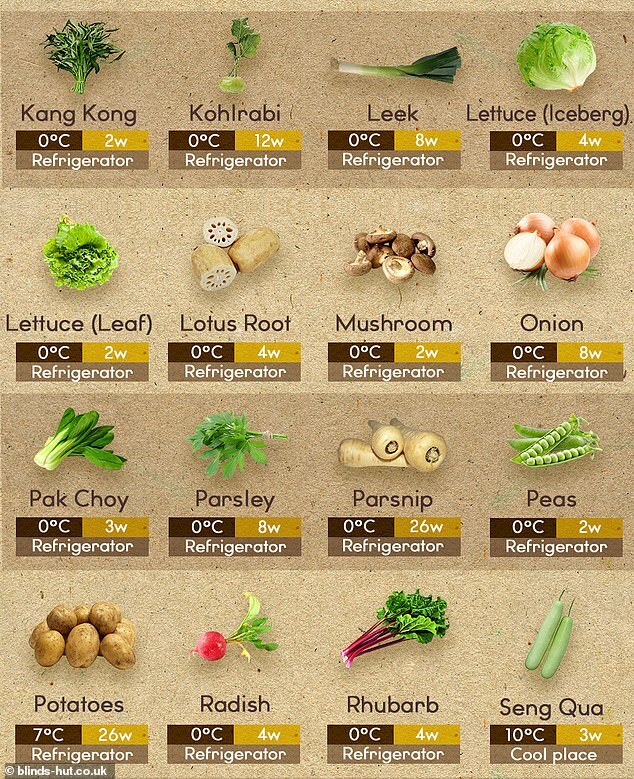 Now experts have revealed the best way to store your fresh produce to ensure it stays fresher for longer, with hardy vegetables such as parsnips lasting as long as 26 weeks if you keep them in the coolest part of the fridge at 0°C. 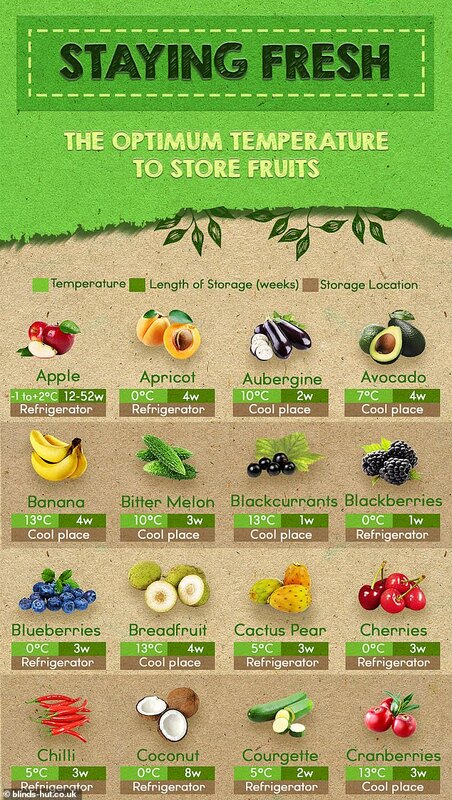 In an effort to help people to minimise their household waste and save money, blinds-hut.co.uk spoke to wholesale traders to find out where to store fruit and veg, and the key to maximum lifespan is getting the temperature just right. 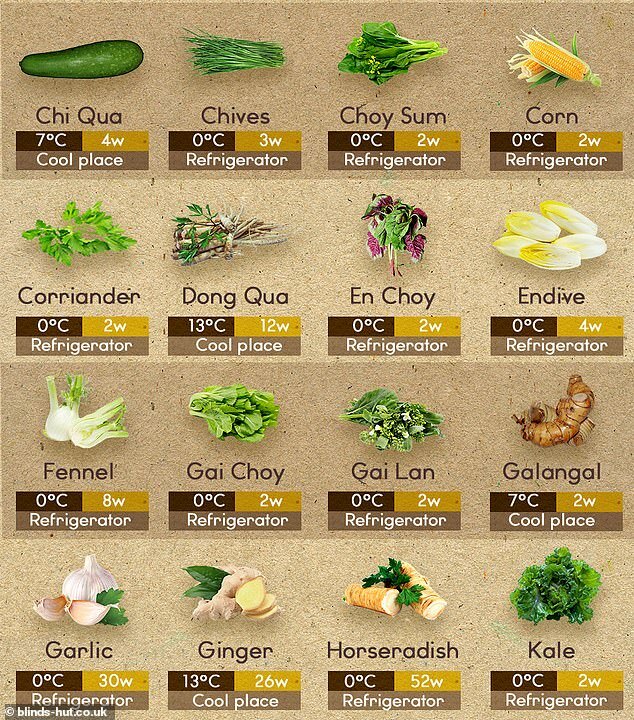 For instance, fruit and veg, such as broccoli, cauliflower, apricots and cherries are best stored in the fridge at 0° to 2°C. This means they should go in the coldest parts, which tends to be at the bottom, usually in the drawers, and towards the back of shelves close to the cooling element. 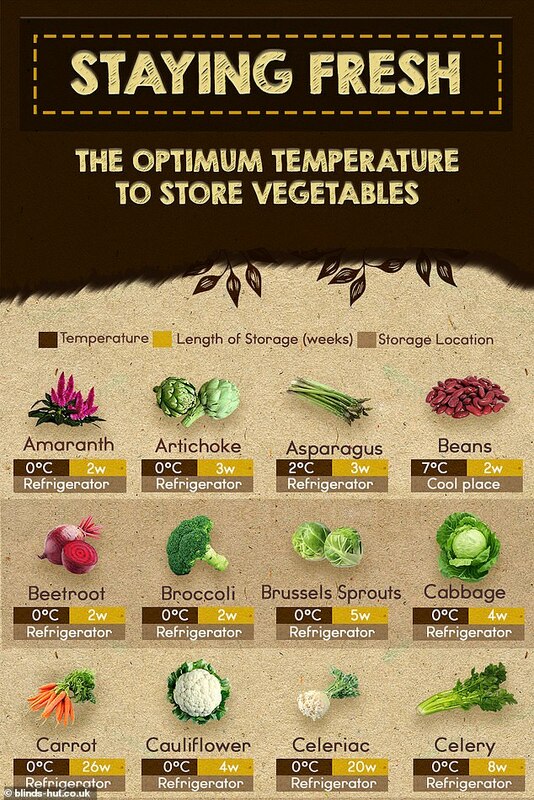 Those that can take a temperature of 5°C and above such as asparagus and potatoes, could live on a higher shelf. 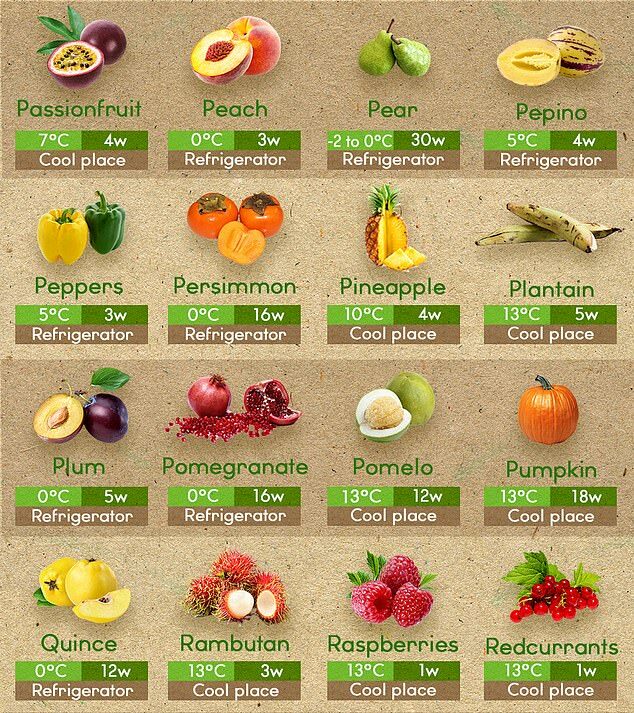 For produce that should be kept outside of the fridge, those that can stay in a cool place at 13°C, such as cranberries and grapefruit, can be kept in a kitchen cupboard. 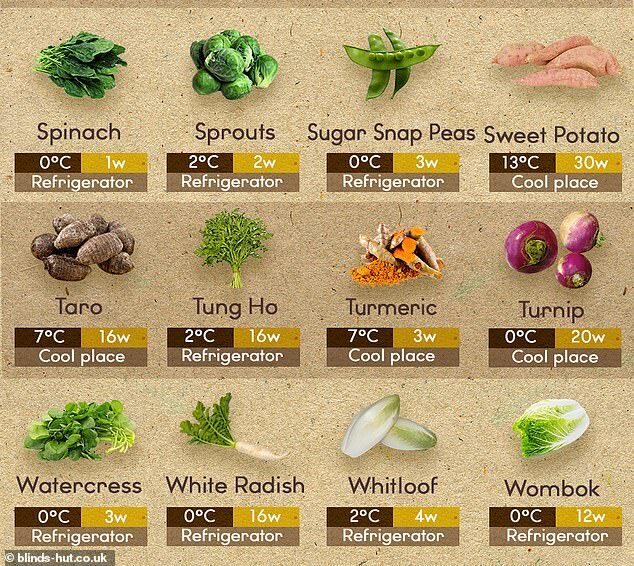 Produce that needs a slightly cooler temperature of 10 degrees or lower, like aubergines and avocados, is ideally kept in somewhere that is a little more separate from the main warmth of the house such as a utility room or garage. 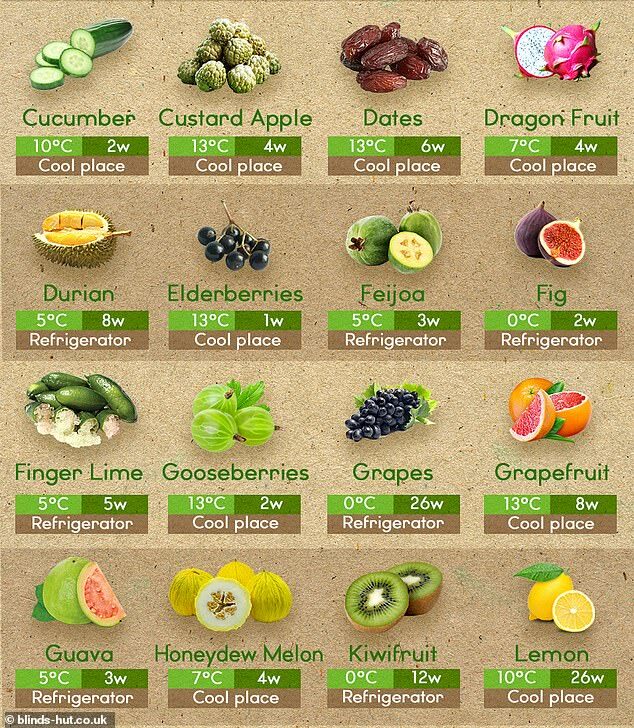 And the list of produce that should go in the fridge, might surprise you. While you might usually put your apples in the fruit bowl, they should go in the fridge, along with oranges, plums and mandarins. Meanwhile, onions, potatoes and garlic should also go in the fridge and not the storage cupboard. Following the tips means that you can make some produce such as potatoes, carrots, ginger and parnsips last as long as 26 weeks by keeping them in the fridge. 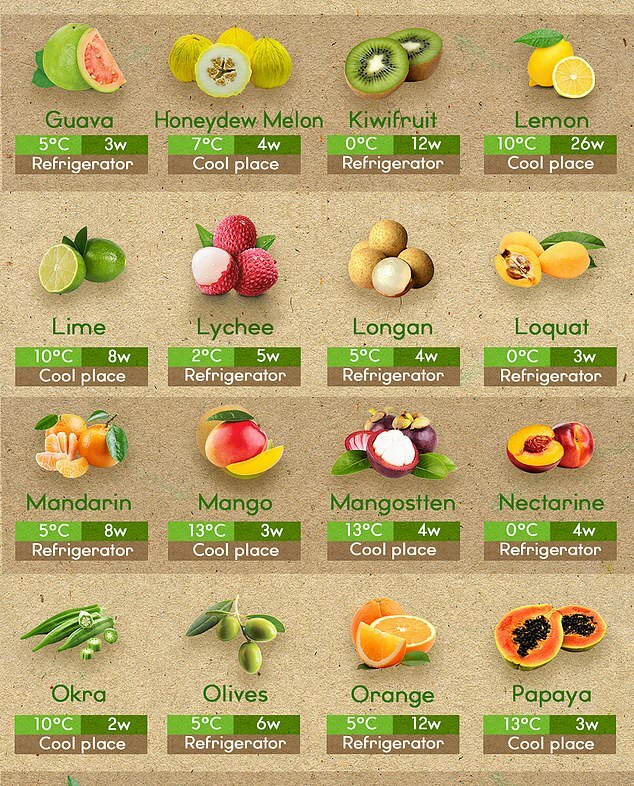 Other fruits with an impressive shelf life include grapefruits and lemons, which can last as long as 26 weeks in a cool place, and oranges, which can go on for up to 12 weeks in the fridge. Edible food waste costs British households £13 billion a year. Half of all food waste takes place in the home, it’s said, which costs UK households £700 a year, according to food waste charity WRAP. Twenty-five per cent of the world’s fresh water supply is used to grow food that is never eaten, according to the United Nations. At the current rate, an additional 2.3bn people will be on the planet by 2050 – which will require a 60-70 per cent increase in global food production.